Last Saturday millions of France Internet users saw a strange message on Google's Homepage, rather than any GOOGLE DOODLE, as shown above. Despite Paying €150,000 ($228,147) Fine to France Government, Google has been forced to post a 'Privacy Fine Notice' on its French Search Engine homepage for violating Data-Processing and Freedoms Laws. 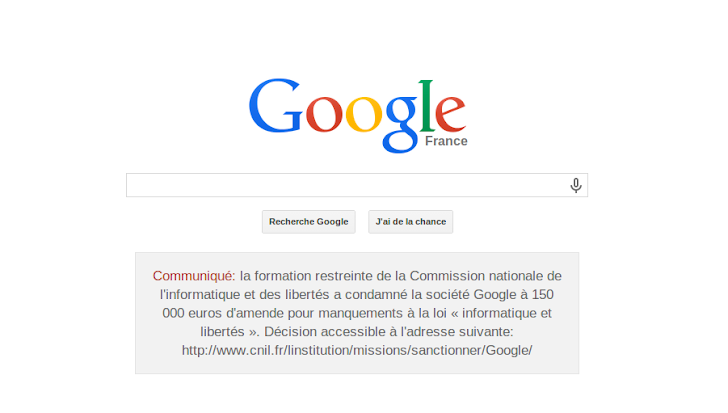 The French Data-protection authority - 'The Commission Nationale de l’information et des Liberties' (CNIL) said on Friday that Google's appeal to suspend the order of January decision has been denied by the Conseil d’Etat i.e. The Administrative Court and the company is ordered to post a notice for 48 hours on its Google.fr page within eight days as of the notification of the decision. On Thursday, Google asked a French court to suspend the order, arguing that posting a notice of the €150,000 ($204,000) fine would cause ‘irreparable damage’ to Google's reputation, but the court rejected the appeal of the company to avoid shame. This is the first time a European country has ordered Google to post such a notice. The Sanctions Committee, said that the company has failed to inform its users of the conditions in which their personal data are processed, nor for the purposes of this processing; which was not specific as the law requires, nor the ambit of the data collected through the different services concerned. "The company does not sufficiently inform its users of the conditions in which their personal data are processed, nor of the purposes of this processing. They may therefore neither understand the purposes for which their data are collected, which are not specific as the law requires, nor the ambit of the data collected through the different services concerned. Consequently, they are not able to exercise their rights, in particular their right of access, objection or deletion." CNIL said. "The company does not comply with its obligation to obtain user consent prior to the storage of cookies on their terminals. It fails to define retention periods applicable to the data which it processes. Finally, it permits itself to combine all the data it collects about its users across all of its services without any legal basis," it added. "The published text will be framed using the style the company uses for information presented at the bottom of the page. The boxed text will be published at a size no smaller than 13 points in the font called Arial, sans serif. The RGB color (177, 68, 54) will be used for the word “Communiqué.” The RGB color (102.102, 102) will be used for the rest of the text, including the hypertext link." CNIL said in a PDF.